This is the Housatonic River in Connecticut the day after Hurricane Irene. It was at its second highest level it has ever been at in the past 100 years. (I am assuming there are no records prior to that). Several areas in town suffered some severe flooding from this river and other smaller streams and brooks. 8.4 inches of rain in 24 hours will do that. Wow!! Our River is SOO low right now-its amazing the difference. wow, that's huge. The water levels here in Maine raised a little after Irene. It's also been raining here for two days, I wonder if we might have a little flooding. We don't usually get flooding too bad, but it makes for some great pictures! Thanks for sharing, I'd love to see what the river looks like when it's not as high. Where in New England are you? I'm in Western MA and we've had Obama declare our local areas a natural disaster. The flooding has been insane and the river was out of control. I posted pics of our area last week. This non stop rain (we've gotten 6 inches in the past 2 days) is not good! And now it looks so calm…wow! Wow that is a full river. I remember the river in town flooding when I was younger. My folks took us down there to see how high it was. Big event in a small town, ya know?! WOW, and here I was thinking, "what a nice peaceful river"! Wow, that's crazy! I can't believe how much rain the area got. Wow that's incredible! I can't believe how we're not getting any rain and you guys are getting bombarded with it. Has it gone down significantly since that day? At first I was thinking it looked nice and peaceful until I read the level is at it's highest. I wish it would rain here in California. Everything here in Texas is the complete opposite! Our lake had as island that the kids could swim too, now we walk to it and there are new "islands" popping up everywhere. Our lakes and rivers are SO low! Wow that is pretty high. 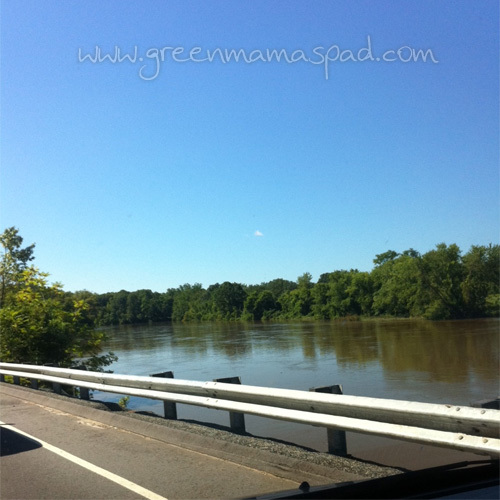 Our river got high this past week but not that bad! I hope there wasn't too much damage. That is quite high. Wow is right!! Hope all is well! Oh my, I hope it goes back down for you all soon! Both of my children live in Connecticut and told me that all the rivers near them (i.e. Naugatuck and Connecticut) are extremely high. My oldest (in the Army) got called to the shoreline to help with whatever was needed and he said the waves were "awesome!" Wow. That is pretty high! That is crazy! We received a ton of rain last weekend to. Trees were down everywhere from the ground being so saturated that it couldn't hold them anymore. Wow! How did this hold up after last week's rain? We had some major flooding in West Hartford. Our local park turned into a lake for a day . . .
Our rivers here are INSANELY high too. I hope they are starting to go down!